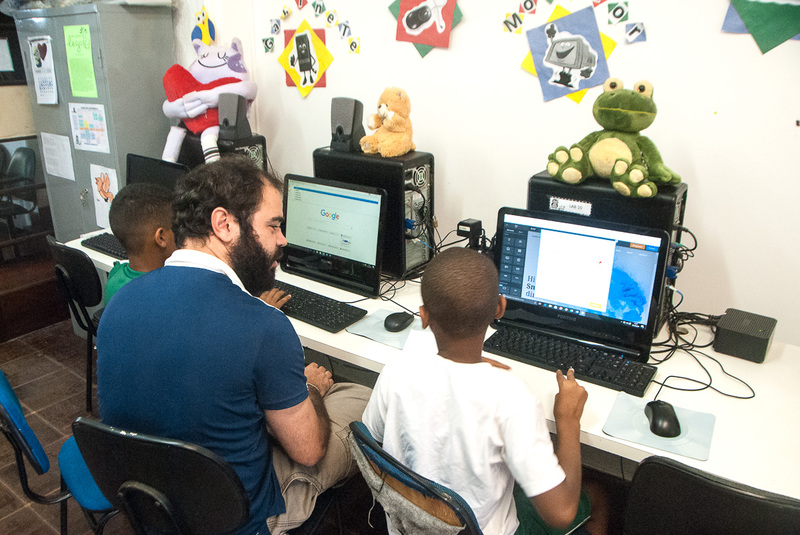 Edumais teacher Felipe Barbosa helps students in Rio de Janeiro, Brazil, with the day’s lesson in Global Web Designers, a Level Up Village course that includes collaboration with partner students in the United States. In cooperation with Level Up Village, EduMais has introduced a new, exciting class: Global Web Designers. The class is an exchange program between EduMais and The Rumson Country Day School in New Jersey, United States. It gives eight children from EduMais and 13 children from our American partner school, aged between 10 and 12 years, the opportunity to exchange video letters and create a joint website about renewable energy. These video letters are a great way for the children, living in completely different settings, to get to know each other, learn about the peers’ country and become connected. By using the Do-It-Yourself Website builder Weebly, kids are jointly creating high-quality websites about the topic of the class, renewable energy. They learn about this crucial topic while getting familiar with Web Design at the same time. Browsing the web for pictures showing solar panels or wind turbines and exploring how to add them to their website is super exciting for the kids. Through the video messages, kids can exchange ideas for the websites and tell each other what is most interesting and fun for them. “I will upload videos and games so that people can learn and have fun at the same time,” says Geovana, EduMais student, in the video message to her peer student Hugh. Diana Nijboer, Founder and Director of Edumais, helps a student record a video messages to his U.S. partner. The video exchange is an important part of every Level Up Village course and gives students the opportunity to discuss the experiments they’re doing, share possible solutions to global warming and learn more about each other’s daily life and culture. In order to learn about what’s behind it, the kids learn to code in a playful way, by using the platform Code.org®. On this site, kids program scenes from Star Wars by typing in instructions for the characters, i.e. by coding! We stimulate independent learning and critical thinking by using the Socratic method. This teaching tactic focuses on asking questions and motivating children to find answers independently, instead of providing answers. Therefore, Socratic learning “forces the class to think in a disciplined, intellectually responsible manner”. In our Global Web Designers Class, our teachers Felipe and Diana integrate Socratic learning by brainstorming with the children, collecting children’s already existing knowledge, and only then explaining further facts. This way children are motivated to actively think about the current topic. And children research renewable energy on the internet and answer questions about their home countries for the video messages, which also fosters a probing mind. Another important aspect of the class is the cooperation with the American partner class. Level Up Village’s mission is to “globalize the classroom and facilitate seamless collaboration between students from around the world”. Exchanging video messages and learning about the U.S. opens up a completely new world for our kids. Hearing and seeing American kids directly talking to them about their life and culture in the U.S. is an exciting experience that the kids have never had before. It widens their horizons, makes the kids more familiar with the U.S. and with the English language and creates an international mindset. “If you came to Brazil I would show you Christ, the redeemer,” says Taynara, EduMais student, while her peer student Conley from New Jersey would be excited to take her to Disneyland in Florida. In addition, the class teaches kids 21st century skills, which are crucial for this Z-GENERATION; other names for this generation include “screenagers” or “digital natives.” The topic of Web Design is in line with Level Up Village’s focus on the development of STEAM (science, technology, engineering, arts and mathematics) skills. As Web Design has become increasingly important, improving children’s computer literacy opens up vast opportunities for them, whether it is becoming an entrepreneur and creating an own online business or working in Web Design for a company. Thank you to all involved people to help us develop children’s skills in global collaboration and communication across national, social and economic divides! This article was originally published on the EduMais blog here. Marianne Mann: At EduMais, Marianne was responsible for the organization's communication and social media. She also identified and established relationships with partner and volunteer organizations and helped run the first Global Web Designers Course. Marianne recently returned to her native Austria.